Hello and happy Friday and welcome to another Project Challenge. This month's challenge was metal--sheet or corrugated. The only problem is, my heavy metal supply (AC/DC, KISS??) is in storage due to the house selling business. I used something metal that had survived the "packing it away to sell" frenzy--a metal drawer liner intended to hold dry goods such as flour. I left it as is, a little imperfect like me. I stenciled the word Grow. on it, using Fusion Mineral Paint in Seaside. I then sprayed it with Helsman clear spray and screwed two holes in the back and added picture hanging wire. I threw a few aluminum cans in the bottom, and then planted it up. In a week or so, it will be in full bloom and the flowers will start to cascade out the front and I will smile. 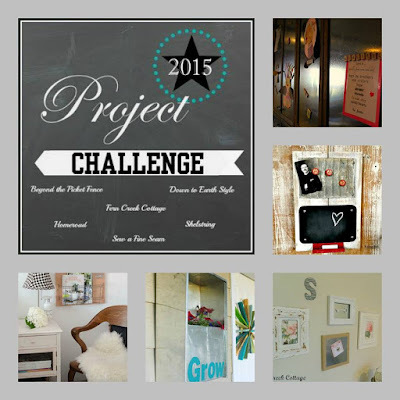 NOW, sit back and enjoy visiting the other bloggers joining me in the challenge! And now we would love to see your metal projects. Please link them up here and remember to include a link back to Beyond The Picket Fence. Becky it is adorable! I love anything metal and I love how you are telling the plants to just "grow"! I love it! What a great idea. That is the perfect grow box! !